Puzzle Hero Game Review - Download and Play Free Version! Face an Evil Ghost Lord and Tons of Monsters! A wicked ghost lord has kidnapped your little brother! Can you battle tons of different monsters in 65 levels and nine towns on your adventure to save him? Play as a young warrior girl in this role-playing match three game. Advance your quest by battling more than 50 types of amusing enemies like the Gangsta Worm and the Ninja Reptile. During battle, fight an enemy by playing a unique turn-based match three game. Make matches of three or more like tiles to make a move. Match three swords to launch an attack on the monster or match three healing potions to heal yourself. If you match three bags of gold, you'll earn money to use at the store, and three laurel crowns will earn you more points toward leveling up. You can also charge your Super Shield to protect yourself from one enemy attack and Super Attack to give yourself one huge attack by matching groups of three shields or three minotaur heads. After you take your turn, the monster takes its turn and can perform the same actions. At the store, you can use your gold to purchase items to improve your character's attack and defense. Buy different weapons, like swords or scepters, or buy shields, gloves, crowns and clothing. You can also buy magic spells such as fire, ice or poison. Everything you buy will be visible on your character as she does battle. This unique take on match three gaming will keep you entertained for endless hours with the amusing monsters, tons of weapons and clothes to buy and the excitement of searching for matches to make that perfect battle move. Once you've beaten the story mode, visit the Arena to battle any monster you've unlocked in story mode. This game is fun for all ages and will sweep you far out of boredom's reach any day! She just wants to find her little brother! Can you help her defeat the monsters so the family can be reunited in Puzzle Hero? 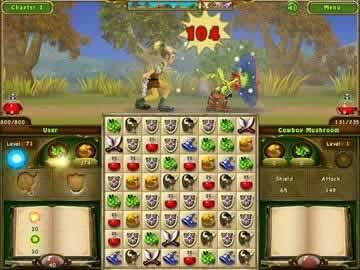 If you like this type of game, try Puzzle Quest, another RPG/match 3 hybrid game that got great reviews. In Puzzle Hero, your brother has been kidnapped by an evil sorcerer and it's up to you to save him. 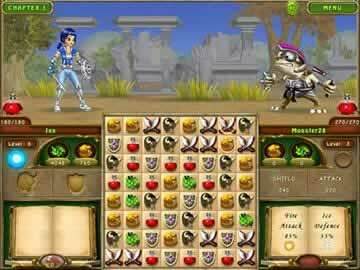 This game brings an exciting mix of RPG and match 3 elements in which your matches dictate your actions in battle, how fast your character levels, and the amount of gold you earn. You can use gold to buy new armor and weapons that improve your stats and give you the ability to use magical attacks. You can make better matches to earn more experience, more gold, powerups that increase your attack or defense, and extra turns that can mean the difference between winning and losing. An excellent game for any fan of match 3 games, with enough RPG elements to be worthwhile to fans of that genre as well. 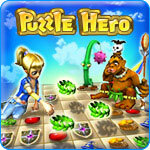 The gameplay in Puzzle Hero is similar to many other match 3 games (and Puzzle Quest). You have a large grid full of various items that represent things ranging from experience to attacks. By making matches of 3 or more with these items, you can gain experience and level your character, attack an opponent, heal yourself, unlock powerups, and more. You and your opponent take turns making matches, but making a match of four or more items will earn you an extra turn. Above the grid is a small frame that shows your character and the enemy, where attacks play out. Your goal is to simply bring your opponents health to zero before your health hits zero. Beating opponents earns you some gold, and before you move on to the next enemy you can visit the shop and buy more powerful weapons and armor that will make winning battles easier. Trying to create larger matches or deny your enemy good matches does bring a small element of strategy to the game, but there is little else beyond that. The matches you can make are determined in large part by luck. You might be able to easily defeat an enemy in one battle, and then could be completely crushed by the next one. The enemies don't change drastically throughout the game either. They gain more health, hit harder, and have better defense, but don't introduce any sorts of new challenges or problems to deal with. This can make the game somewhat repetitive and boring as you make the same matches and face very similar opponents. Like other similar match 3 games, the controls for the game are simple and easy to learn. Matching items is fairly easy, and can be done via clicking the mouse. The game gives you a quick explanation on how to create matches before you start playing. You'll also get helpful tips throughout the game (from making matches to buying new weapons/armor). The story in the game is told through simple black and white story panels between towns. It's not all that interesting or important when it comes to the game, and can be overlooked fairly easily. The graphics for both the 3D battles and the match 3 portion of the game, however, look great. The graphics are very sharp and colorful, and look better than those of many other similar games. The audio doesn't stand out as much, but isn't bad either. If you're looking for fast-paced and exciting match 3 action with some RPG elements thrown in, Puzzle Hero might be just the game for you. While some issues like the limited strategy and story involvement can hurt the game, there are plenty of positives to outweigh them. Your matches dictate your actions in battle, how fast your character levels, and the amount of gold you earn. You can use gold to buy new armor and weapons that improve your stats and give you the ability to use magical attacks. You can make better matches to earn more experience, more gold, powerups that increase your attack or defense, and extra turns that can mean the difference between winning and losing. Whether you're into match 3 or RPGs, this game is well worth a try.